Google just released Smart Rescheduler, a plugin for Google Calendar, into Google Labs, and it’s one of the most flat-out useful apps they’ve ever made. It’s simple to use, but does an impressive amount of legwork automatically. 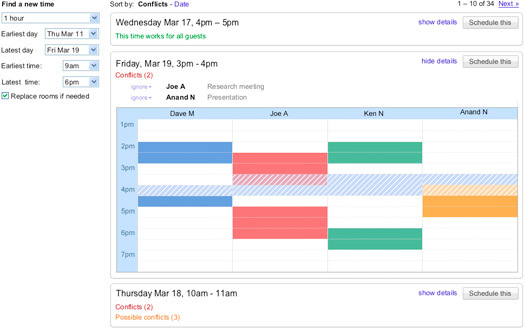 Smart Rescheduler makes use of the ability to share calendars among different people: you select who you want in your meeting, and it pores through everybody’s schedule to find and then rank the best times. That part seems relatively simple, although useful enough as it is–but there’s much more to the app than that. It ranks the most ideal meeting time and place through a few simple questions, like which person should get the most preferential treatment, how many people are attending, location, and a user-defined window of time in which to schedule the meeting. It’s not a new idea, but integrating the feature into Google Calendar, which many businesses use primarily, makes the app that much easier to integrate. It’s still in the Labs enclave, which means it’s still being developed and may have little quirks, but it’s easy to see the feature becoming indispensible. More indispensible than the meetings it’s scheduling, even.